Anthropologist photographing tourist photographing the spring equinox at Chichen Itza. March 2010. I have this thing about taking pictures of people who are taking pictures. This goes back to the days before I ever called myself an anthropologist. It's not a really unique habit--I think I may have picked it up from looking at the work of people like Eliot Erwitt, or maybe Garry Winogrand. It could have been Lee Friedlander. I'm not sure. What I am sure about, however, is that I find the whole process of taking pictures fascinating. Why do people take cameras with them...seemingly everywhere? What do they get from the whole process of making small reproductions of people, places, and events? These kinds of questions apply to tourists like the one pictured above, of course. That image reminds me of a passage in Don Delillo's book White Noise, in which he talks about the most photographed barn in America. Do we go to these places to actually see and experience those places? Or to make photographs of them and paste them into albums--or onto sites like Facebook and Flickr? Do we see the actual place, or do we just see the cameras in front of our faces? Have cameras (whether SLR's or iPhones) become a key medium for experiencing, documenting, and remembering people and places? 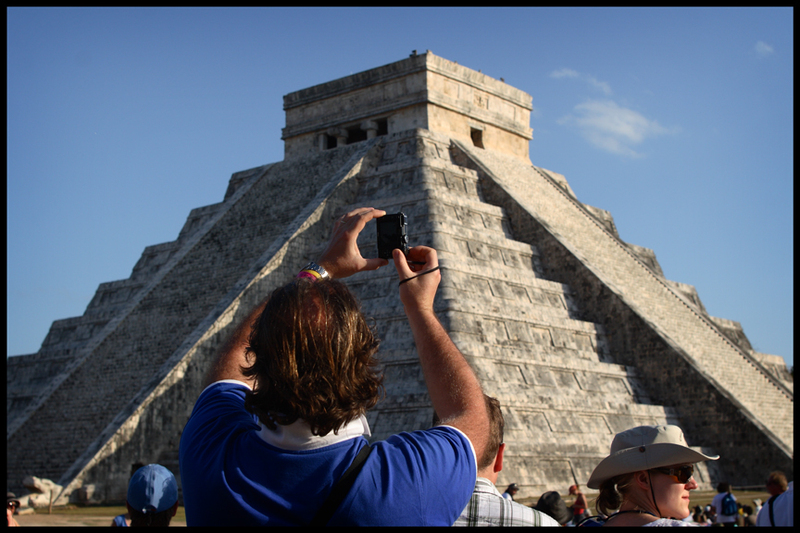 Anthropologists use cameras as well, and many of the same questions that apply to tourists apply to them as well. Remember how Vine Deloria famously painted that infamous picture of the anthropologist and all of the gear they carry around? One of the key items, of course, was the camera strapped around the anthropological neck. The relationship between anthropology and photography goes way back..and so does the relationship between anthropology and film. Despite certain practitioners who spend most of their time thinking about the importance of WORDS in the disciplinary canon, it's pretty clear that visual media has always been a fundamental element of the anthropological enterprise. Interestingly, however, while many theory and methods books spend a lot of time talking about participant observation, writing fieldnotes, coding, interviews, and a whole slew of other methods, there isn't always a lot of talk about visual methods as a core part of doing anthropology. Well, there isn't enough, if you ask me. Thankfully, people like Jay Ruby, Sarah Pink, Fadwa El Guindi, Paul Hockings, Elizabeth Edwards and many, many others have laid tremendously important foundations that others can build upon. Because, if you ask me, anthropologists--more anthropologists--should start thinking as much about visual media as they do about writing fieldnotes. Why? Well, because communication of ideas should be a crucial element of anthropology, and if visual methods and theory and methods become a more prominent part of anthropological training this will undoubtedly be a boon to the field. For more than one reason. Photography matters. Film matters. And this is why I have really been looking forward to this issue that seeks to talk about anthropology "Beyond Words" (to make a nice allusion to something that Margaret Mead said long ago). As it turns out, this issue is packed with contributions that cover a wide swath of visual territory. We have contributions from Colleen Morgan, Reuben Ross, David Picard, Katie Englert, Sara Perry, Kerim Friedman, Charlotte Noble, Rian Davis, and Leah McCurdy. We also have a fantastic photo essay by a photographer that I really admire: w robert angell. He is not an anthropologist, but I have found his work immensely fascinating and anthropological on many levels (his "contents" image, included in this essay, always has a kind of archaeological feel to it for me). I am also really pleased to have his work in this issue because I think that anthropologists can learn a lot from photographers, journalists, and filmmakers--and vice versa. There is something good about looking around and seeing how different people use, think about, and approach the world around us. That's what I think. Let me know what you think--and thanks for checking out this latest issue of anthropologies. Thanks also to the anthropologies editorial crew for all of their continued help, and of course to all of the contributors who took part in this collaborative effort. Thanks everyone. PS: Check out the "Best of 2011" page as well! !